Image caption Around 11 million vehicles globally have been fitted with the so called "defeat devices"
It said it had been advised by lawyers that the company's conduct "gives rise to legal claims under German law". "Norges Bank Investment Management intends to join a legal action against Volkswagen arising out of [the fact that] the company provided incorrect emissions data," the statement said. 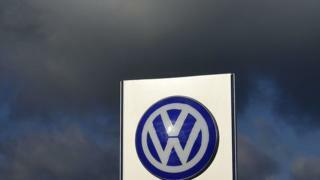 The planned legal action against VW is part of the fund's wider strategy for its investments to be "much more ethically and environmentally conscious", said Christian Stadler, professor of strategic management at Warwick Business School. However, he added, it was also a part of its campaign for minority shareholders to be given more of a say in German corporate governance. "It has had disputes with Volkswagen for many years over its governance, as the Porsche family are effectively able to do what they want; as the largest shareholder, they really only have to consider the State of Lower Saxony, which has a 20% holding, and is where the company is headquartered. "In Germany, minority shareholders don't have much of a voice, which is something the fund has campaigned against before, as 4% of its equity is in Germany," added Prof Stadler. "It will not divest in Volkswagen, but wants to working towards changing its corporate governance structure."